Instant Pot Applesauce Recipe - Made In Just Minutes! Instant Pot applesauce is one of the easiest and healthiest recipes that you can make! It’s made in minutes and has no added sugar. In fact, it is one of the very first recipes that I made when I was trying out my new electric pressure cooker. I had purchased a Instant Pot 6 quart duo on Amazon Prime Day many years ago. 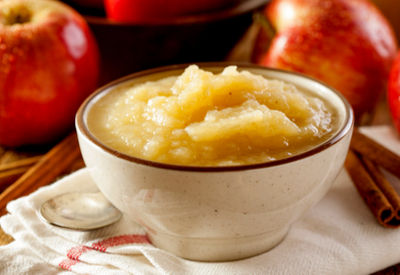 Instant Pot applesauce is one of the easiest and healthiest recipes you can make! And like many others, I was a little bit nervous to try out this ‘new to me’ cooking device. So I jumped right in and gave Instant Pot Applesauce a shot. I have always made my own homemade applesauce on the stove. I would boil down my apples and wait by the stove, stirring the apples to make sure nothing would stick to the bottom of the pot. And after 45 minutes, I could then finally walk away from the kitchen. Reading about how quick foods cook in the Instant Pot, I gave my applesauce recipe a try. I was AMAZED!!! 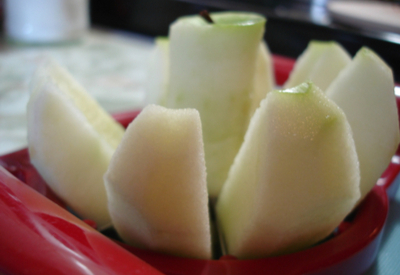 Using an apple corer and slicer makes it easy to make applesauce. With just 8 minutes of actual cooking time, the Instant Pot Applesauce was done! No waiting over a hot stove and no stirring the apples. Just walk away and you have made applesauce! Of course it takes time to peel, core and slice the apples. You don’t have to peel them if you are going to use an immersion blender to puree your applesauce. I prefer to have a slightly chunkier texture so I do peel my apples before placing them in the pot. And to make things go a lot quicker I use an apple corer and slicer which cores and cuts each apple into 8 wedges. 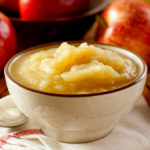 It is best to use a variety of apples when you make your own applesauce. The different flavors of each apple compliments one another in this recipe. 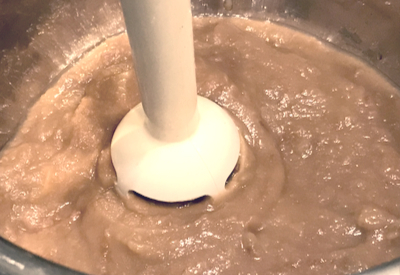 If you like your applesauce smooth, use an immersion blender to get the right consistency for you. But not all apples are best to use for applesauce. I use a variety of Jonathan, McIntosh, Jonagold, Golden Delicious and/or Rome apples. It all depends on what is in season or what is on sale at the grocery store. Instant Pot Applesauce can be eaten fresh or you can also freeze it for a quick last minute snack or side dish. Delicious, homemade applesauce made in minutes with no added sugar. Peel, core and cut your apples into 8 wedges or large chunks. Add apples and the remaining ingredients into the liner of the Instant Pot. Put on the lid in the sealed position and pressure cook/manual on high pressure for 8 minutes. Perform a slow, controlled quick release of the pressure. Transfer contents to an air-tight container and let cool. Refrigerate for up to 1 week or freeze for later use. I tried the recipe but I think I adjust the amount of water next time because the result is too liquid. I had to put everything in a pot and make a reduction for almost 10’. Depending on the type of apples and how much you blend them, the consistency will change. You can also turn on the saute feature and reduce them right in the pot if you like it thicker. Can you can your applesauce to enjoy later? You can ‘can’ applesauce, but not in the Instant Pot. I always add a little lemon juice and water bath it for 10 minutes to make it shelf stable.